The countdown to Christmas will be starting soon! 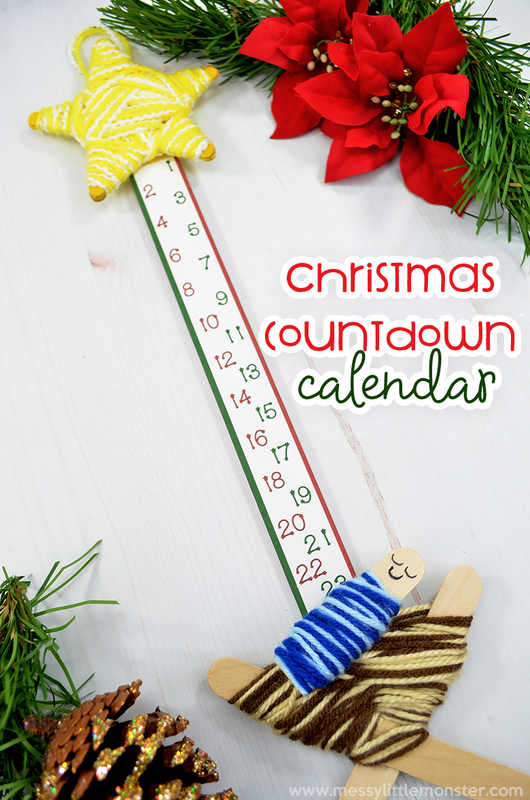 This Christmas countdown calendar is the perfect nativity craft for kids this time of year. Counting down to the twenty fifth of December is such a fun way to get the kids excited and in the Christmas spirit! Just follow the step by step directions below to make your own advent calendar with baby Jesus in a manger. 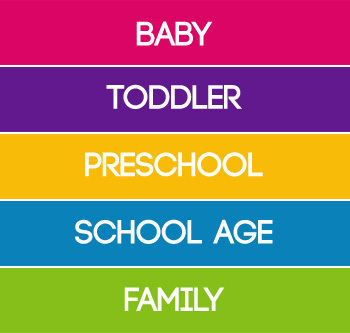 We have included a free printable to make this craft a little easier. For more Christmas countdown ideas, be sure to check out these kids advent calendars or our printable advent calendar ideas! 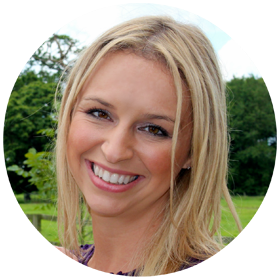 Why not make your own advent calendar to countdown to Christmas this year? Homemade advent calendars are SOOOOO much more fun than traditional ones found in stores. This one even has a baby Jesus in a manger! 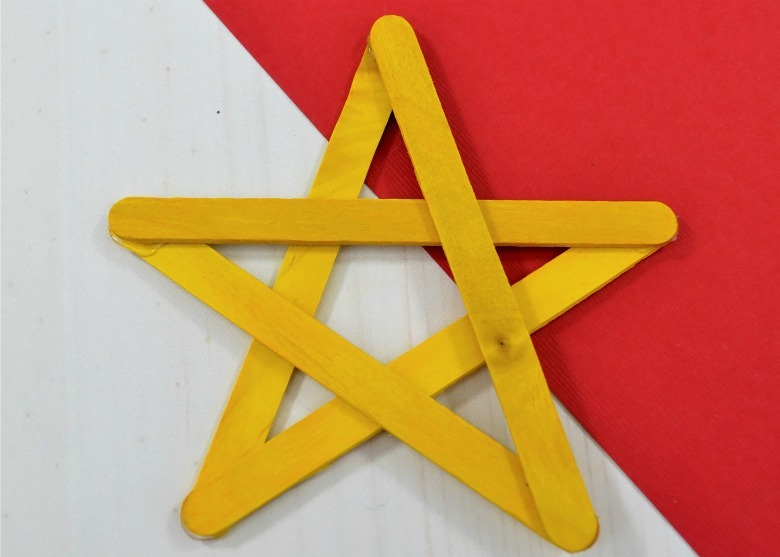 You'll want to make this nativity craft ahead of time. 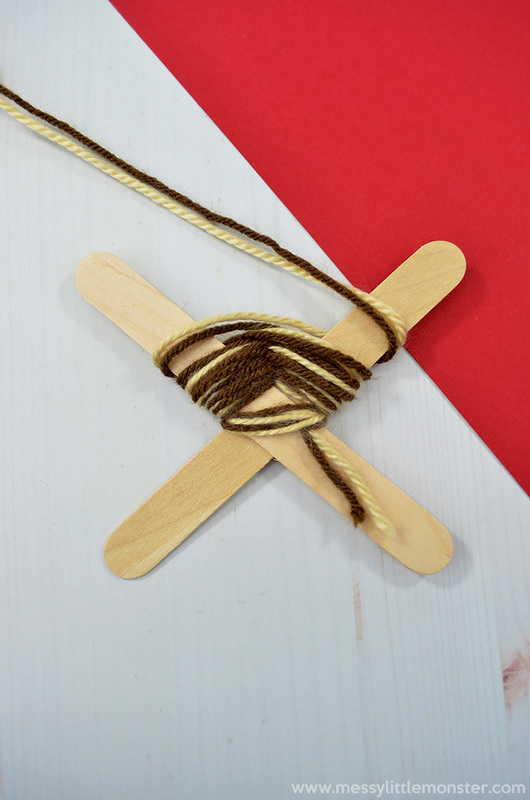 It is a little fiddly for younger children to make but kids will love the finished product whether they make it with you or you make it for them! 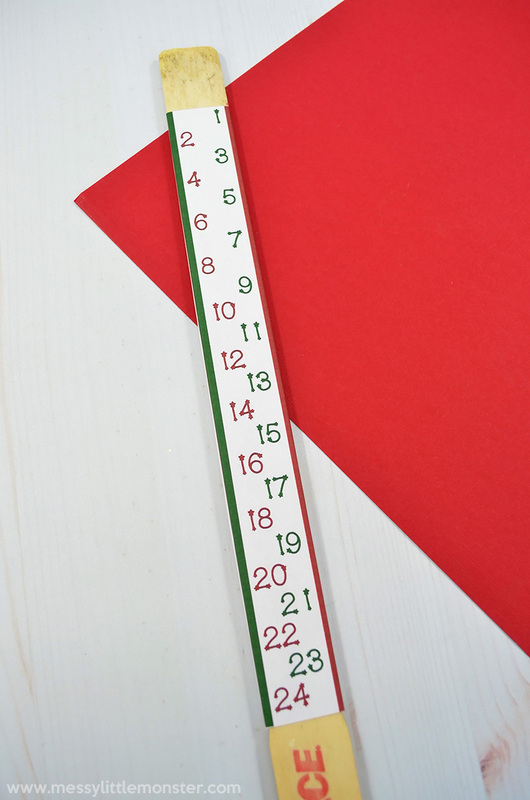 Using this Christmas countdown is great way to get preschoolers and toddlers counting as well as getting older kids ready and excited for Christmas. It's lovely for younger children to be able to physically see how many sleeps they have left before the big day! The best thing about this baby jesus in a manger themed calendar is that you can bring it out to reuse year after year! Just scroll down below to make your very own Christmas countdown calendar. We have more nativity craft ideas that you might like to check out! 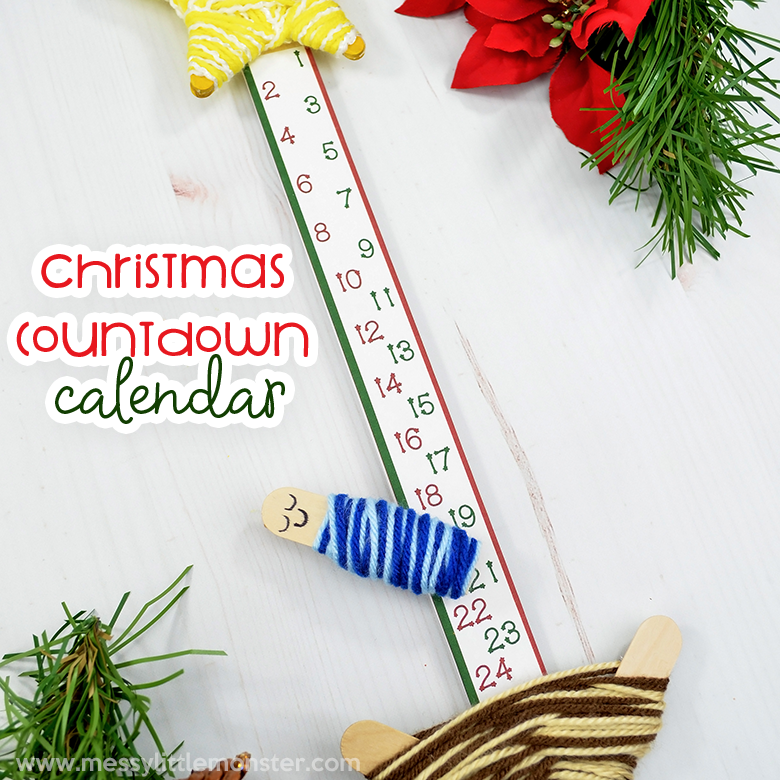 SCROLL DOWN BELOW FOR THE FREE CHRISTMAS COUNTDOWN PRINTABLE! This nativity craft has quite a few stages involved in making it so I really suggest rounding up everything before you get started! It makes the process sooooo much easier. Be sure you have the template downloaded and printed off too! Scroll down below to grab that if you haven't yet. Now, to get started, you are going to make the manger. 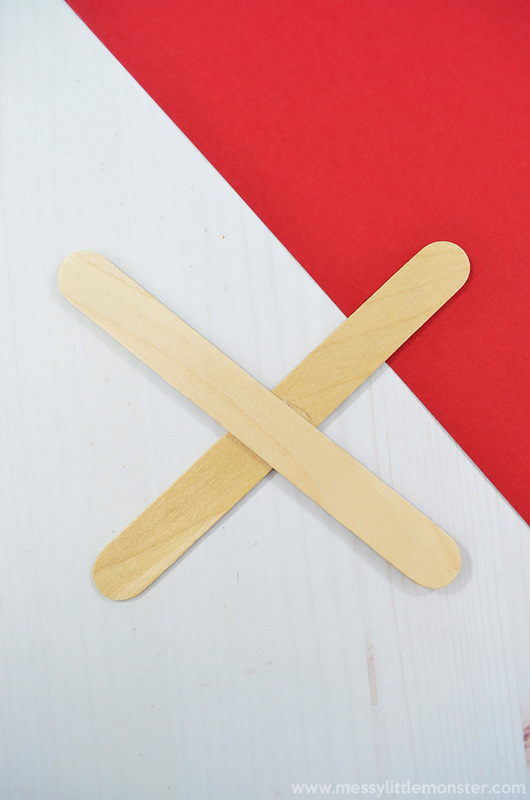 To do that, glue two jumbo craft sticks together in the form of an "X" shape with a hot glue gun. 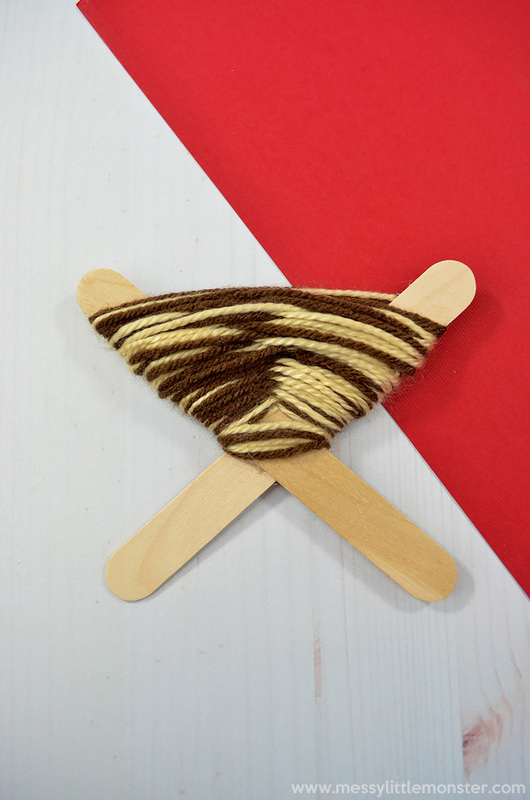 Then, wrap it using two different brown coloured yarns. Weave them around the manger by starting on the left side and crossing over and under the left stick and then back up again. Repeat for the right hand side. Keep going until the majority is covered in yarn, leaving the tip uncovered as shown below. 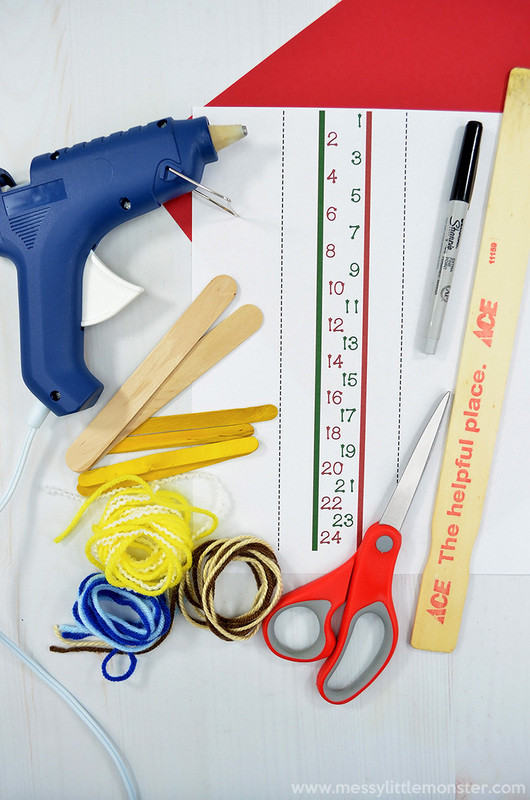 Use your hot glue gun to secure the ends in place. Next, let's create the baby Jesus! 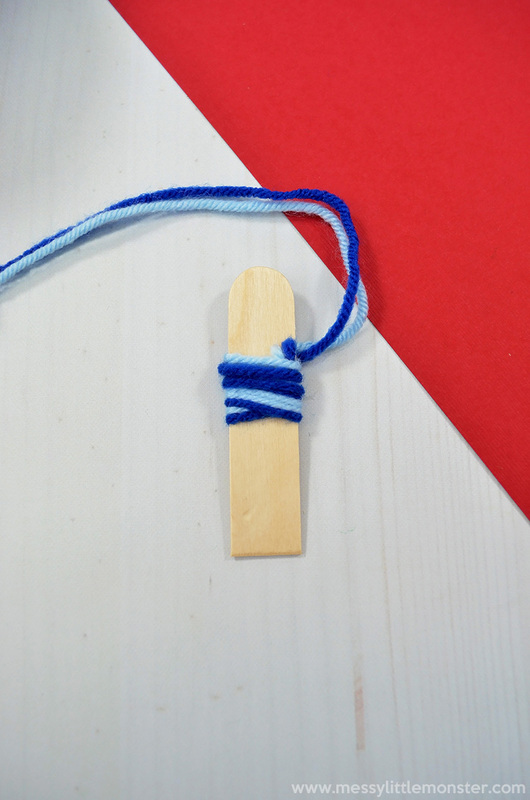 Cut a jumbo craft stick in half and then take one of the halves and wrap it with two different colored blue yarns, leaving the top uncovered. Take a sharpie and draw a face on the uncovered portion of the craft stick. Then, hot glue the baby Jesus to a clothespin - this will be the marker on your Christmas countdown calendar. Be very generous with the amount of glue and apply pressure to hold into place until it has completely cooled. 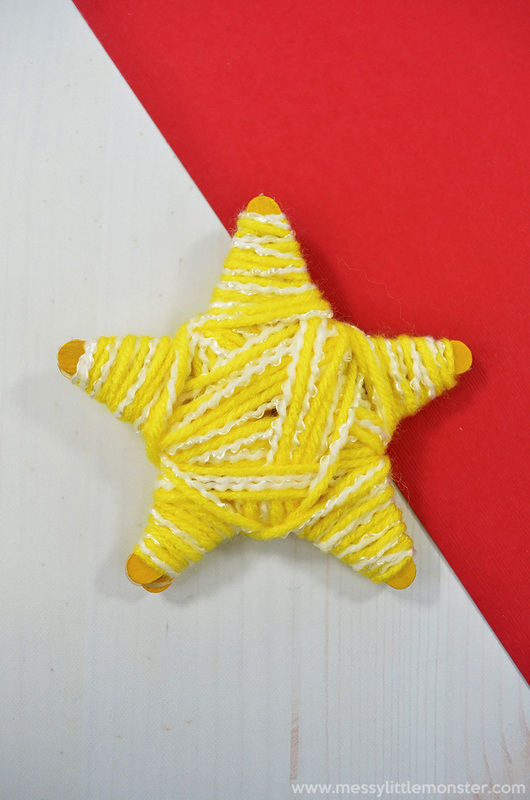 Once you've done that, glue the yellow craft sticks in a star formation and wrap them with white and yellow colored yarns. Now let's finish off the Christmas countdown calendar! Cut the template along the dotted lines and then wrap it around the paint stirrer, gluing or taping it on the back to secure it into place. Next, glue the manger at the bottom and then the star at the top. Again, be very generous with the glue and apply pressure until it has cooled to secure both pieces into place. That's it! Your Christmas countdown calendar is now complete. Use your baby Jesus as a marker to countdown to Christmas! 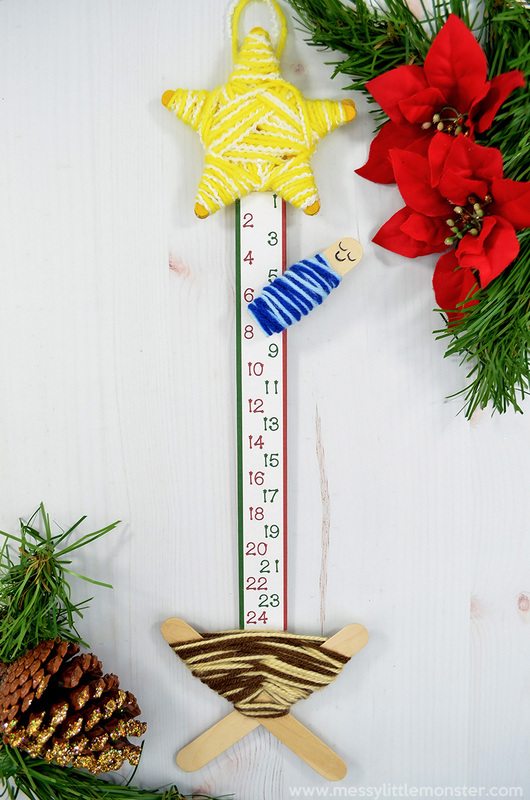 DOWNLOAD THE FREE CHRISTMAS COUNTDOWN PRINTABLE! To download this Christmas countdown printable for free add $0 and click on the 'I want this' box below. It may take a moment for the page to load so please be patient. For personal use only. Not for redistribution. All images are copyrighted. 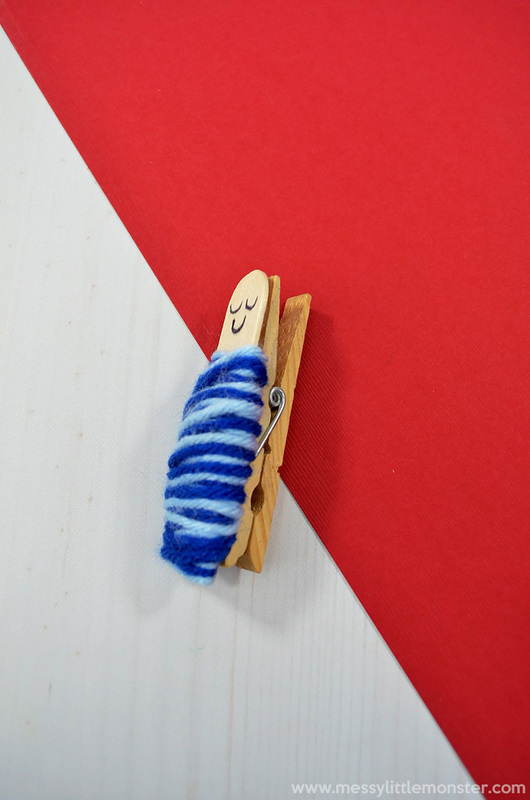 We hope you enjoyed making this nativity craft either for or with the kids. 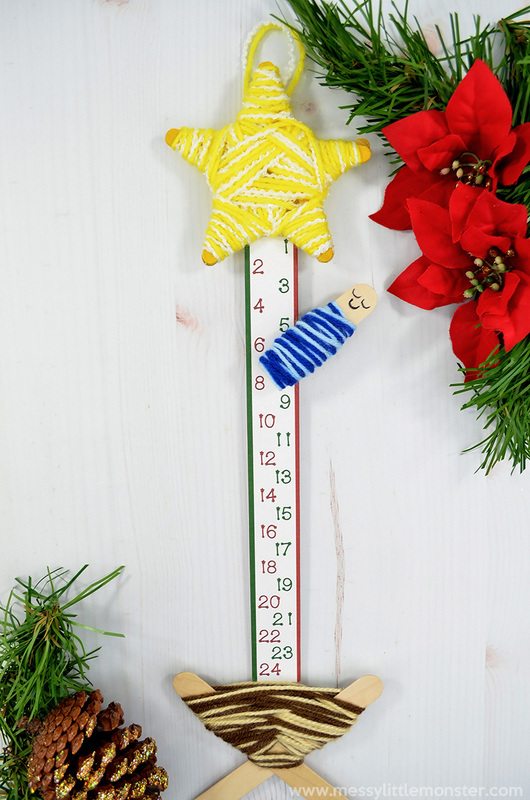 This countdown to christmas calendar is a great activity for this time of year to teach toddlers and preschoolers about counting as well as getting older kids excited about Christmas. It makes the coundown to Christmas so much more exciting if you make you own advent calendar rather than buy a shop bought one. I love that this Christmas countdown calendar can be reused year after year! For more nativity crafts for kids, be sure to check out this Christmas nativity scene!